Cuisinart has made a more versatile and functional update to the old toaster ovens we used to know. This one can double as a second oven. Skip heating your larger oven as you bake an entire chicken, broil fish, even cook a twelve inch pizza on your countertop. 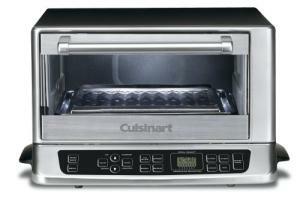 The large capacity Cuisinart offers three cooking options: bake, broil, or toast. The toasting option has bagel, defrost and reheat functions and can prepare up to six slices at a time. The TOB-155 has both clock and oven timers. An auto shutoff engages after four hours. This toaster oven is a lovely matte black with stainless steel accents, stylish for almost any kitchen. It also comes with a three year limted warranty. This smart toaster oven uses an Exact Heat sensor to maintain a precise oven temperature. The Always Even shade control yields consistent toasting, uniform browning. The electronic touchpad control is enclosed for easy cleaning. The easy to clean interior has a nonstick coating. The wire rack (which has two positions), broiling pan, and drip tray are dishwasher safe. There is a removable crumb catcher and a manual with many recipes to encourage regular use. Beware of the oven door, which gets very hot when the oven has been in use. Also, the handle is designed in a manner that can allow you to burn your hand if you tend to grasp the handle instead of simply pulling it from the front. Customers love how quickly the oven heats and that it doesn't dry out food the way less expensive models can. The only complaints about this neat little oven are that it is bulky and toast doesn't always come out as desired, but other items seem to do very well.